Resynchronizing skincare for day, night, and weekend. Despite being quite a fan of the makeup, Chanel skincare has never interested me much. I have tried a lot of samples, but Chanel has some pricey products, and I never found anything that was the worth the splurge and/or really did anything for my skin. 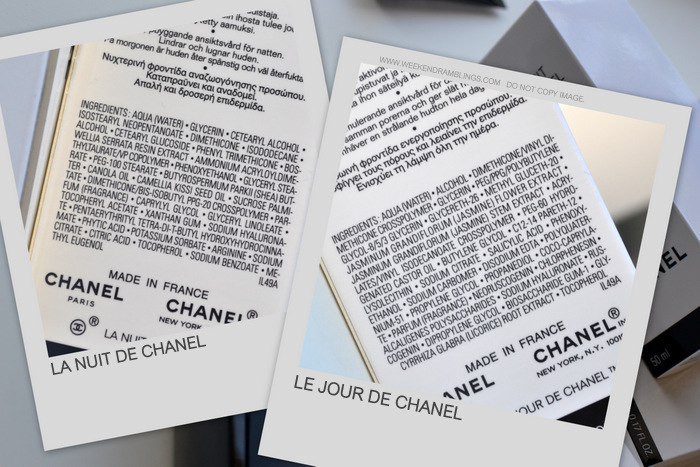 Last month, I got to try samples from a new "resynchronizing skincare" collection from Chanel - and liked it enough to pick up full sizes of two of the products. This new line consists of 3 products, one each for the day and night and one for the weekend, that can be used to supplement your regular skincare routine. Appropriately named Le Jour de Chanel (for the day), La Nuit de Chanel (for the night), and Le Weekend de Chanel (for use on weekends), these can be used as serums under a regular moisturizer. Le Jour de Chanel - Contains jasmine extract and salicylic acid. Helps keep the pores clean and skin looks fresh due to the gentle exfoliating properties of salicylic acid. La Nuit de Chanel - contains frankincense extract calms skin to prepare for overnight repair and hyaluronic acid to restore skin's hydration. I love the pump-dispenser packaging on these bottles - so much more hygienic than the tubs and jars! Le Weekend de Chanel and La Nuit de Chanel are creamy and slightly thicker lotions. Le Jour de Chanel is quite a runny, gel-like lotion, quite thin in consistency. Le Weekend smells a bit like the Hydramax range - a sharp, clean sell that I don't like much. La Nuit smell more like the Sublimage range, a floral-based scent. Le Jour doesn't have much of a fragrance to it. Obviously, I quite like this new skincare routine. I don't have to make any drastic changes to my existing skincare routine or throw away products that are working fine for me. At the same time, I get to take tiny steps into antiaging - something I really should be looking at now - without using heavy creams that tend to cause break outs. Le Jour de Chanel is perfect for my oily-combination skin as it gets oily during the day. La Nuit de Chanel works overnight at keeping pesky dry patches that I tend to get over my cheeks and forehead at bay. Both absorb quite easily and are light enough to be used comfortably under my regular skincare. I feel my skin looks healthier, cleaner, and I definitely notice a softer look to my skin when I wake up in the mornings. Le Weekend de Chanel is a weekly treatment - use once (or twice a week), both morning and evening, instead of your regular moisturizer. This is a glycolic acid based treatment, and I was a bit worried about it irritating my skin, but I found it very mild. I do need to take care to stay out of the sun and use sufficient sun protection while using this, though. I stay at home weekdays, so I use this some time around the middle of the week :P I think my skin looked a tiny bit fresher after using this, but I really cannot tell for sure. I haven't yet made up my mind about buying this, mostly because I still have enough samplers remaining. Overall, I think this is a good routine for someone with combination-oily skin - most people I know with this skin type don't take too well to the usual antiaging creams while most salicylic-acid based treatments tend to leave skin too dry. Chanel seems to have found a happy medium with some well-balanced products that aren't too difficult to incorporate into any regular skincare routine. A little goes a long way with these products, and I see these bottles lasting me a while. I do wish there were more samplers available to try before buying or some kind of a starter kit that was a little less expensive. The samples I got were from Chanel online (a gift of sorts for regular customers), and Nordstrom online currently has an offer with purchase (Chanel). Night cream: Currently using the Clinique Moisture Surge Overnight Mask or Lush Dream Cream. I am just getting into their skin care Rads. I tried a couple of their products and I am really impressed ! I am just debating on what to skip as I can't buy all at one go !! Hi Radhika... how have you been? I have used Hydrabeauty range of Chanel Skincare (Gel Creme and a sampler of Hydrabeauty Serum) and I just love them. Agree that it's skin care is very very expensive. I have only tried the foaming cleanser and found it perfect for oily skin in India :D Most whitening creams/cleansers seem too drying for me..
Aww..glad to help!! I wish Chanel would add the ingredients information on to their website. Would be so much helpful, won't it? I don't always go to the counter either - do most of my ordering online - and I really appreciate companies who add in all the info online. Great post Radhika! I'm thinking of getting the Le Weekend for my combi skin and wanted more info all the blog posts i read were just regurgitations of the press release!